Now, with 20 years under my belt, I still want to improve my teaching, but my primary objective for the year is about my students — how I can push them b eyond what they think they can learn. As a science teacher, I want to help my students develop the skills to master the Next Generation Science Standards. These standards require students to critically evaluate content, data and ideas, and communicate their learning through argument-driven inquiry. My primary goal is to create a classroom culture that supports students as they ask questions, collect data, summarize the evidence, and craft arguments to justify their answers to their questions. The pressure is on me, but it’s an exciting, positive pressure. This is not how I learned science. It is more rigorous and challenging. Many students are not accustomed to taking ownership of their learning in this way. Some are reluctant to accept that they have something valuable to contribute. From experience, I have learned that every student has untapped learning potential. This potential is released when students gain confidence in their abilities, as I continually support their learning. My hope is that I will be able to help my students move ever closer to their best version of themselves; that they will learn more than they thought they could; and they will come to expect even more from themselves. My hope for this year is that students will recognize the potential I already see in them — and strive to exceed it. Dr. Pamela Harman is the 2008 Alabama Teacher of the Year and a member of the National Network of State Teachers of the Year (NNSTOY). 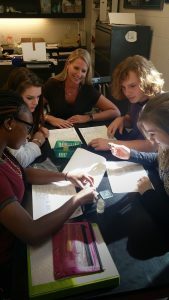 Dr. Harman holds a Doctorate in Teacher Leadership, a Master of Geosciences from Mississippi State University, and a Bachelor’s Degree in Biology, Earth and Space Science from the University of Alabama at Birmingham. She has been teaching in the Hoover City School system for 20 years. She is a former member of the U.S. Marine Corps and a National Board Certified Teacher.